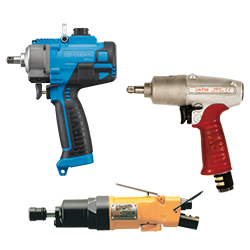 Pulse tools combine the speed of an impact wrench with the repeatability of a shut-off nutrunner. The unique design of a pulse tool, combining motor power and hydraulics, leads to an assembly tool that produces smooth, controlled torque in a series of very fast (2-4 ms) events and virtually no torque reaction. AIMCO’s pulse tools are lightweight, have low vibration and lower torque reaction, which make AIMCO’s Pulse Tools the safest assembly tools available for threaded assembly. AIMCO pulse tools - when PRODUCTIVITY, ERGONOMICS, RELIABILITY, and QUALITY matter.